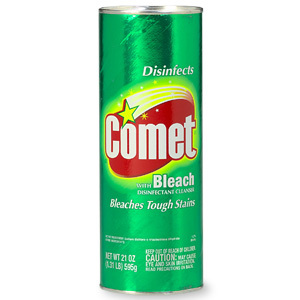 On Checkout 51’s list this week (Sept 12-18, 2013) is Comet bathroom cleaner, Valid on Comet Bathroom Cleaner and Comet Spray Gel Mildew Stain Remover. This non-abrasive, bleach-free disinfectant penetrates and dissolves soap scum and hard water film while it cleans. Comet® Bathroom Cleaner is great on such surfaces as fiberglass, glazed porcelain, stainless steel, chrome, plastic and vinyl, shower doors, tubs and tile, sinks, and toilets. You will get $0.50 cashback rebate at Checkout 51. Here’s a pic of what it looks like. I found a couple prices of it at a few stores. I didn’t find any Comet Bathroom Cleaner coupons to use.